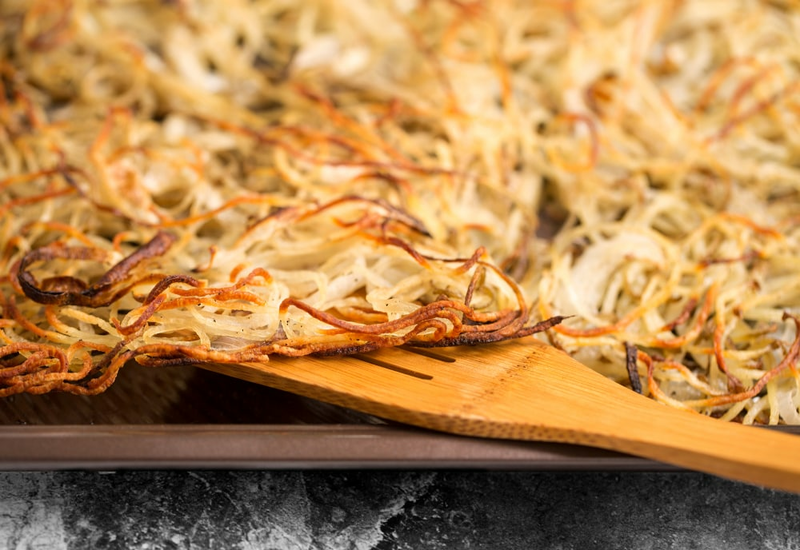 Serve crispy, golden hash browns at a gathering and you'll instantly win favorite host status. 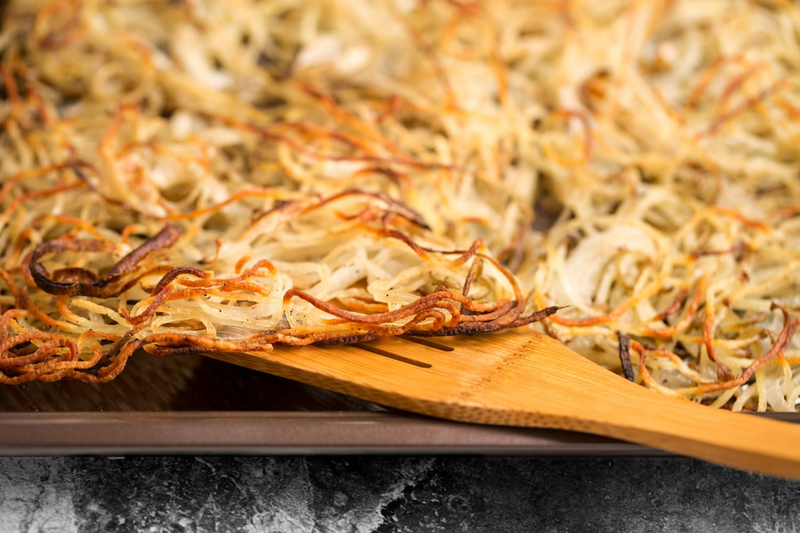 In this easy, vegan recipe, you can bake hash browns for a crowd, entirely in the oven. 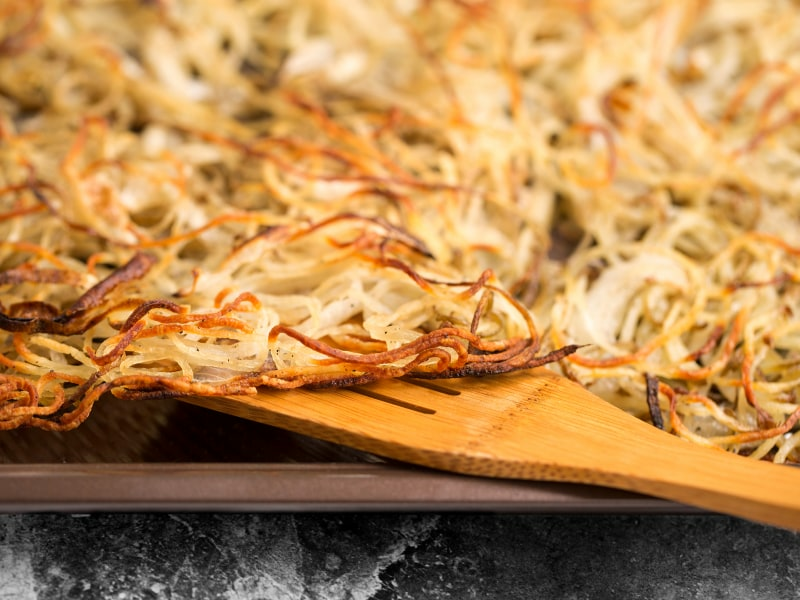 Instead of shredding the potatoes, make easy work of the task by spiralizing them into long strands. (Your wrists will thank you!) Another benefit of baking the hash browns, instead of frying them, is that you don't need to baby sit them on the stove. This frees you up to do other things, like stir up some mimosas! To make a brilliantly ruby red "flannel" hash, substitute beets for half of the potatoes. Nobody likes potatoes when they turn black. To preserve raw potatoes from discoloring, keep them submerged in cold water in the fridge. The potatoes are best seasoned immediately after they're cooked. Per Serving: 174 calories; 7g fat; 25.2g carbohydrates; 3g protein; 0mg cholesterol; 192mg sodium. These hash browns turned out better than any other recipe I've ever followed! They were the perfect texture and so easy to make. I combined these potatoes with beets and they were perfectly crispy and flavorful. Before I would always use my hand grater which was messy and difficult. Using the spiralizer was so much easier, I love it!